Operating Systems: Macintosh OS X, Unix and Windows. Developed and released in May, 2012, the "Convert Cocoa Colors" Mac app lets developers easily convert from HTML and Photoshop Hex to Cocoa UIColor, cocos2d and NSColor code formats. Colors can also be grabbed from the screen, other apps or the built in color well. Convert between Cocoa coding color formats - Convert between HTML and Photoshop Hex color format to UIColor, cocos2d and NSColor formats. The format can be directly edited. When ready, the color format can be copy and pasted into code. Capture screen colors - When option selected the cursor becomes a crosshair and the screen and app colors are visible in the app with a magnification of the current object under the cursor. A hot key is used to grab the current color. Select color from color well - Built in color well for selecting the desired color. Set whether to display on top of other apps. Set the floating point precision of the color format. NSRegularExpression used to parse user entry and modification of color formats. NSCursor and NSTrackingArea for setting the cross hair cursor when capturing colors outside the app. NSBezierPath calculations in drawRect: for displaying magnified cross hair cursor with magnified image of object under cursor. Convert between rgb byte and floating point to HSB and Hex color values. Mix ARC with retain/release variable tracking. 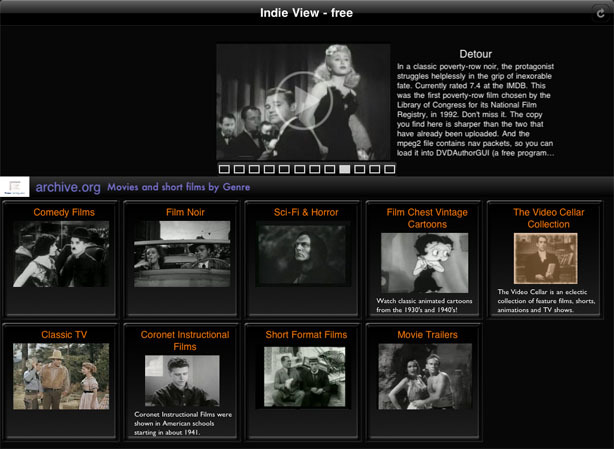 Developed and released in July, 2011, the "Indie View - Free" iPad native app is used to watch public domain classic movies, cartoons, TV shows, short films and trailers. Custom video player - Built video player using AVFoundation low level classes: AVPlayer, AVAssets, etc. With custom video controls for rewind, play/pause, fast forward, timeline scrubbing and video duration display. Custom video selection - Built custom scrolling, with touch gesture selection, Hulu like featured video selection at top of main screen. Custom video categories selection - Built custom scrolling video category (Comedy, Film Noir, Sci-Fi & Horror, etc) buttons for selecting respective movies listing. Custom Split View Controller - Modified custom split view controller to display category movie listing with scrolling detail section. Built custom movie listing cells to display movie poster image, year, rating, title, description and watched status. Updates featured movies and category movies from custom IndieView server RSS feeds based on Archive.org feeds. The data can be updated manually for featured movies or categories with the main screen refresh button or individual categories with the refresh button in the category movie listing. Custom app settings for selecting the automatic movie update period from server the IndieView RSS feed. Custom notification when app is install to IndieView server. Custom RSS feed download management and parsing. AVFoundation for custom video viewer. UIButton for gradient background button and category button. UIControl to display movie rating stars. UIImageView for asynchronous download of movie poster images. UITableViewCell for custom movie cell information. UINavigationBar for custom bar controls. NSOperation for background thread processing. Blocks for animating visual display and loading AVURLAsset. Reachability wi-fi detection for movie playing. Preprocessor directives for debug and test cases. Popovers for displaying and getting information. Gesture recognition for custom swipe and touch events. Custom drawing of controls with UIBezierPath, CGColorSpaceRef, CGGradientRef, etc. Integrating and troubleshooting publisher integrations in Actionscript 2 and 3. Plugins into the adap.tv platform to online video advertisers. Worked on various projects developing the Adap.tv AdPlayer in Actionscipt 2. Worked on backend site coding in Java Wicket. Worked on integrating and troubleshooting publisher integrations in Actionscript 2 and 3. A different version was developed for the 2007 TechnoLawyer eBook with a button at end to download the PDF of material presented. This can be seen at TechnoLawyer eBook Press Kit. Note: During this period, with saving from working prior dot.com work, pursued interests in Film with acting, scriptwriting and film projects. Developed site for Kat Guevara Design in HTML with Flash portfolio viewer. The Flash viewer dynamically loads the list of portfolio images to view from a server XML file. Then the custom actionscript scrollbar displays portfolio images as the mouse moves over it, see katapult portfolio. Senior Software Engineer. Developed in .NET with ChartFX graphical reports in the eTagInformer software for ACLARA. The reports displayed breakdowns and data from gene and protein analysis. Senior Software Engineer. Developed in C, C++, MFC and java collaborative web software called BrainScope. Developed web backend in ASP and VBScript. Solaris version of collaborative software developed in C.
Gomo Technologies, Inc. – acquired by Pomp, Inc.
Senior Software Engineer. Developed front and back-end of GoMo Mail product in java. The front end is a java applet and the back-end are JSPs (Java Server Pages). GoMo Mail is a interactive internet email product with drawing tools, still and animated images with upload capability for custom graphics. Converted and implemented redesign of Clipper XBase program to Visual Basic to manage Liability, Property, Automobile, and Workers' Compensation insurance for Catholic Diocese. Upgrading Commission Management System program for Pacific Atlantic Administrators subsidiary from Clipper XBase program to Visual Basic. Wrote Auto Attendant java program for the InstantOffice PBX, full LAN/WAN connectivity product in Java for Tim Kusumi's team. The Auto Attendant program was coded in Microsoft J++, calling a custom telephone COM control to speak to the caller and route calls to appropriate extensions. Wrote Java applets in Symantec Visual Cafe environment for remote configuration of the InstantOffice system for Eliot Weitz's Remote Configuration team. Softbank Expositions and Conference Co.
Wrote and maintained ImageMap applet and Quiz applet at for the Java World Tour sponsored by IBM, Netscape, Sun and Novell. Java text conferencing/chatting client applet/program and server program called Synergetic Chat. Subscription version operational at Intercommunicate. Wrote Macromedia Shockwave web audio listening control for music band, "Dorothy's Melting". Worked on "Haunted by Waters" CD-ROM and created interactive CD-ROM for music band, "Dorothy's Melting" in Macromedia Directory 5.0 and Adobe Premiere. Created interactive product presentation of VoysConnect and VoysAccess products for computer telephony show CT-Demo 1996 in Orlando Florida. Video testimonials were shot in Standard Betacam, digited on my pentium 90 with the Miro DC20 video digitizer and edited in Adobe Premiere. Writing Visual Basic Telephony rapid application development code generator call VoysDesigner for Voysys, Inc. This development environment allows a telephony developer to visually create the actions of a telephony response system in a spreadsheet format. The developer uses a toolbox of telephony icons such as Speak, Get Digits, etc., to construct the flow of the telephony call on a spreadsheet form. The code is generated as a complete Visual Basic project and run interactively into Visual Basic. The entire product is called VoysAccess for Visual Basic which includes a Visual Basic control for telephony control. Version 1.2 for Visual Basic 3.0/Windows 3.1 completed in December, 1996. Writing Visual Basic Telephony rapid application development code generator call VoysDesigner for VoThe next version written for Novell is extended for network centric telephony. A telephony server with telephony boards interacts with Visual Basic clients controlling telephony operations. VoysDesigner was enhanced to manage and create Visual Basic projects on Novell Telephony servers and extended beyond USEnglish (French, German, Italian and Spanish language support added.) The project for Novell was completed in mid-1996. Writing Visual Basic Telephony rapid application development code generator call VoysDesigner for VoThe most recent version, VoysDesigner 2.5, was written for Windows NT and Visual Basic 4.0. The major enhancements to VoysDesigner 2.5 is internationalization with all the bitmaps and strings in a resource file. This version was also delivered to a corporate partner in Japan. Writing Visual Basic sales tracking system for pen based computers. Downsized Mainframe program that originated in late 1970's on IBM System 36 mini to Novell 3.11 Clipper XBase program. This is a major enterprise program that rates Liability, Property, Automobile, Workers' Compensation and Miscellaneous insurance, producing reports and billing. The programming took over 1 year, operates as a Client/Server system in protected mode. Hardware: Install and program dedicated Novell 2.2 50 user Network with 11 workstations. Install 9600 baud modem, mice and network printers (Apple Laserwriter IInt and Epson FX printers.) Most of the workstations are 386SX with VGA. Software: Install shared Windows 3.1, Word for Windows, Pagemaker, FoxPro Lan and various other software on network. In February 1994, wrote Visual Basic Access database program to track telephone sales leads for 21st Century Learning products. Created multi-user notification capability and find operation based on any text entry area. Modified and fixed bugs in Foxbase+/Mac inventory and invoicing program. Edited animated cartoon called "The Dunsky's" on Macintosh to video with MacroMind Director and Aldus PhotoShop software. Produced full page ad of "The Dunsky's" for The Hollywood Report with Aldus PhotoShop and Aldus Pagemaker software. Software: Started in May 1994, Visual Basic claims management program for managing claims to insured pest organizations. The program contains 53 insurance forms from Application to Claims Summary forms that manage claims for pest control organizations. The insured pest controllers can be seperated by region such as Northern California, Southern California, Georgia, etc. An OLE and DDE connection to Lotus' Ami-Pro supplies mail-merge capabilities. And, the communication module allows remote users to update the central Access database. Clipper XBase programs rating programs for government agencies. The retrospective rating program rates Liability and Workers' Compensation for six different government agencies. Rates are calculated retrospectively on claims incurred in the last four years. Also, integrated system of 13 programs to insure public entities, two programs to insure Loggers and the Pest Controllers of California. Debugging and modifying three Clipper programs written by a prior programmer. Rewriting major program to insure Attorneys. Produced forms, maps and brochures with Ventura Desktop Publisher. CLK Enterprises, Inc. and First California Regional Securities, Inc.
Wrote XBase Clipper leasing program. Co-produced 30 second T.V. commercial spot. dBASE III Financial system programs. Two CPM databases written in Turbo Pascal. dBASE II program to bid and invoice indoor plant sales. Updated to Clipper. Bachelor of Arts Degree in Film from the University of California at Berkeley. Film production at San Francisco City College. Pascal and C language classes at San Francisco City College. 8088 Assembler class from San Francisco State College. 1994 – Assistance editor on independent film: "Chalk". 1986 – Assistant to Field Producer at P.M. Magazine. 1985–1986, Production Assistant for "On The Edge" and "Heat and Sunlight" independent films. References supplied on request.